Scottish director Lynne Ramsay has been praised as one of the best living directors. She has made excellent films the best being RATCATCHER and the last one WE NEED TO TALK ABOUT KEVIN. She got into front page news when she did not show up on the first day of shooting of ANNE GOT A GUN, abandoning the project completely and causing the producers to sue. 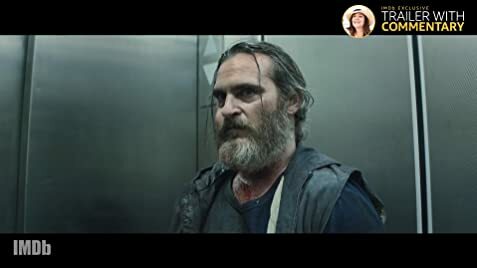 In YOU WERE NEVER REALLY HERE, Ramsay is one of the producers which means she cannot walk out on herself. She presented the unfinished version of the film last year at Cannes winning her Best Screenplay and Joaquin Phoenix Best Actor. Totally deserving! The film is short at 90 minutes, concise and a marvel! This is a dramatic thriller written and directed by Lynne Ramsay, based on the novella of the same name by Jonathan Ames. Joe (Phoenix), a combat veteran and former FBI agent with post-traumatic stress disorder, is a hired gun who rescues trafficked girls. He cares for his elderly mother in his childhood home in New York City. Joe has graphic flashbacks to his childhood and past in the military and FBI. Director Ramsay loves flashbacks as evident in her previous films, and flashbacks allow her carte blanche to do whatever she wishes to shock the audience. The trouble starts when returning home from a job, Joe is spotted by the son of Angel, the middleman between Joe and McCleary, his handler. Joe meets with McCleary, and expresses his concerns about his safety potentially being compromised due to Angel’s son being aware of his address. McCleary then informs Joe of his next job: a New York State Senator, Albert Votto, has offered a large sum of money to discreetly find and rescue his abducted daughter, Nina. The plot thickens with a lot of people getting violently killed. This is director Ramsay’s first thriller though death, killing and the psychology of killing has been dealt with in her previous films particularly in WE NEED TO TALK ABOUT KEVIN. But she treats this film with dead seriousness. Her fascination with themes of grief, guilt and death is present here as in her other films – a strength in her filmmaking. Apparent is the trauma her protagonist undergoes in the film in his path towards redemption. Phoenix delivers a remarkable performance similar to the one he did in Paul Anderson’s INHERENT VICE. That role appears to have prepped him for the role of Joe in this film. Judith Roberts is also memorable playing Joe’s mother. In WE NEED TO TALK ABOUT KEVIN, Kevin, in the final scene tells his mother that he finally discovers the reason he murdered his schoolmates in the gym. When asked what the reason is, Kevin remarks that he had forgotten. 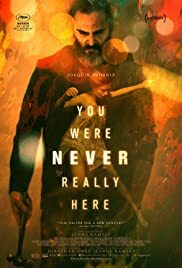 YOU WERE NEVER REALLY HERE also contains a remarkable ending and a bright one (not to be revealed in this review.) A remarkable ending for an even more remarkable film.